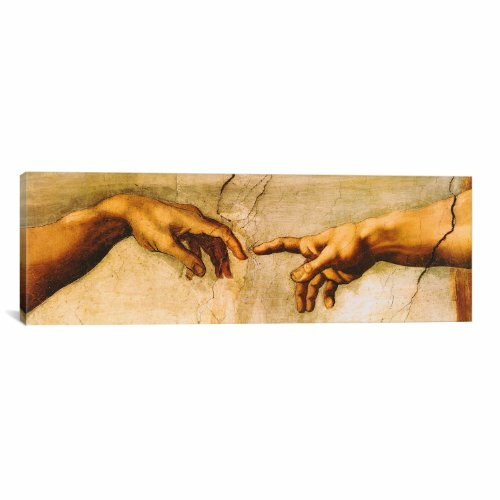 Museum quality The Creation of Adam By Michelangelo Canvas Print. The art piece comes gallery wrapped, ready for wall hanging with no additional framing required. This print is also available in multi-piece or oversized formats, perfect for decorating large rooms and spaces. iCanvasART.com is the best place to buy canvas giclee art prints.Browse our wide selection of modern canvas pictures, original contemporary artwork, fine art reproduction prints, abstract paintings, and discover other great wall art pieces we have for sale. You can also choose your own photo or image to create unique and personal custom canvas prints. We never sell plain paper posters, only the highest quality giclee canvas prints for sale.